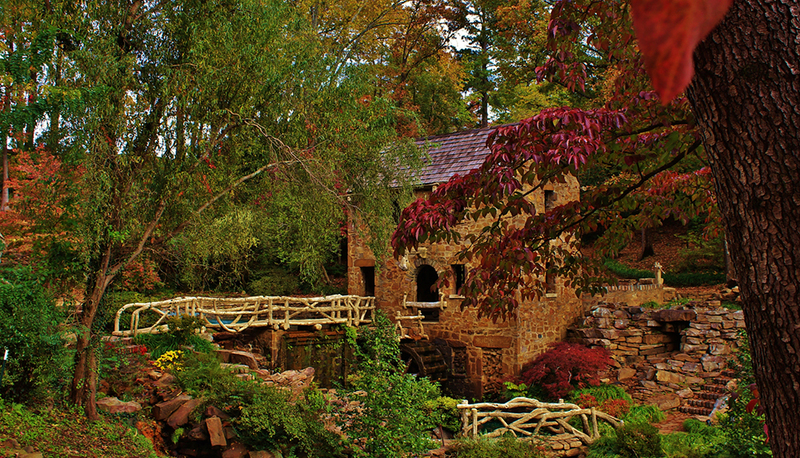 Located in the Deep South, Arkansas has much to offer new and native residents. Beautiful scenery, burgeoning industry opportunities, and a plethora of available properties make Arkansas a great residential choice. It has a population of over three million people and growing. You'll five very diverse geography ranges from mountainous regions to densely forested regions to lowlands. This state is the twenty-ninth largest by area and the thirty-third most populous state in the Nation. Arkansas was originally granted into statehood in 1836 as the twenty-fifth state, and it withdrew from the Union to join the Confederate States of America in 1861. It returned to the Union in 1868, and it has thrived ever since. This state is home to some very fast-growing cities, and you have several choices where you live. You'll have very rural areas, a lot of small communities, or larger cities with several suburbs. Many parts of the state have a more laid-back feel that many people enjoy, and there are many museums, education opportunities, cultural centers, and a varied economy. People move to Arkansas for the lower cost of living as it is well below the national average. In addition, the median housing price is also below the national average, and there are several nationally ranked colleges found throughout the state. People also move to this state for a more relaxed way of living, which can appeal to people looking to get away from the larger cities. However, people move from Arkansas for several valid reasons as well. Residents of the state have a lower median annual income than other parts of the nation, and almost 17% of the inhabitants live below the poverty line. People also move once they graduate college to find higher paying jobs. There are jobs available, but they may not be as high-profile or offer as many opportunities for advancement as newer graduates are looking for, so they move to find them. College-aged people find the larger cities in the state attractive because several of them have a large college town feel, and there are several nationally-ranked universities throughout the state. Also, people who are nearing retirement age find Arkansas attractive because of the lower cost of living and because of the lower housing prices that are found in the majority of the state. Arkansas has something for everyone when it comes to the real estate market. There is big city real estate available for those looking to stay close to work and a short drive from major dining and entertainment centers as well as agriculturally based properties for those looking to be at arm’s length from the hustle and bustle of a major city; as well as everything in between. The more expensive average home prices are in the extreme northwestern corner of the state. Counties such as Boone, Carroll, Madison, Washington, and Newton all have higher median home prices than most of the rest of the state. The eastern ridge of the state, counties like Mississippi, St. Francis, Lee, Phillips, Desha, and Ashley assert the lowest average prices. The central areas of the state are more in-sync with the national average, with counties such as Saline, Lonoke, Grant, Yell, and Hot Spring ranging close to the national average. On average, the overall state of Arkansas didn't have as hard of a time with the real estate housing market crash. The market did fall, but it was more of a gradual drop than a steep plunge. The beginning of 2007 saw the real estate market enter a slight plateau, and this lasted until it started to drop slightly in the middle of 2008. After this point, it had one final steep peak before it began a gradual descent. The start of 2009 saw the final peak in the real estate market, and the market began to fall at a rapid pace until 2010. From the middle until the end of 2010, the housing market plateaued, and then it began its final gradual drop until it hit bottom in 2011. It recovered quickly and spiked at the end of 2011 only to drop one final time. Once it hit this final drop, it began a slow, slight rise from 2012 to 2014. 2014 marked the start of a more rapid climb, and the housing market saw several small peaks in 2015 with a slight drop at the end of 2015. Since 2015, the market has been climbing steadily, and it passed the point it was at before the housing market crash at the start of 2016. Little Rock also didn't suffer as hard of a fall when the housing market crash. The housing market had been on a steady, gradual rise until the start of 2007 when it started to plateau. It had its first slight peak in 2008, and this was followed by a sharp drop that recovered quickly. In 2008, the market hit its second peak and began a sharp descent before going into its final peak before the crash at the start of 2009. Once the market hit this final peak in 2009, it began a gradual descent with one minor peak in 2010. It continued downward until it hit the lowest point in 2011. From the bottom point, it went up sharply and then it leveled off. It began a gradual rise again with peaks in 2014 and 2015. In 2017, the market peaked and dropped again before rebounding and continuing a steep climb. The 1990s saw the start of a gradual but steady climb in the Arkansas real estate market. In 1992, the market saw its first slight drop since 1990, and it recovered quickly. The market continued this upward trend until the first quarter of 1995 when it dropped off once again. It started to climb and hit a slight plateau that leveled out by the start of 1998. The market hit a slight peak in the middle of 1998 that leveled out to another gradual increase that continued until the start of 2001. When 2001 came and went, the market hit a peak and began a slightly steeper climb that lasted until 2003. In 2003, the market began a steep climb that continued its upward trajectory until the second quarter of 2007. It peaked for the first time and dropped off slightly. It continued this gradual descent until 2008 when it dropped and rose sharply in its final peak before it started to fall. Over the past 30 years homeownership across the state ranged between 65% and 71%. In 1993 ownership stood at 70.5% and slid throughout the 1990s to a low of 65.6% in 1999. Ownership jumped sharply in 2000 and 2001, leading to a peak of 71.2% in 2001. Ownership then slid to 69.1% in 2004 before jumping to 70.8% in 2006. During the recession after the housing crisis ownership fell to a low of 65.4% in 2013 and 2014. In 2016 ownership stood at 67.6%. Arkansas has some of the fastest-growing cities in the United States, and people are flocking to them for everything from higher education opportunities, and thriving economy, lower cost of living, or the choice of living demographics. Arkansas, especially the central and northwestern areas of the state, is overall one of the fastest growing states in America; with approximately 1,000 new families moving in each month, it seems that the state is already bursting at the seams. 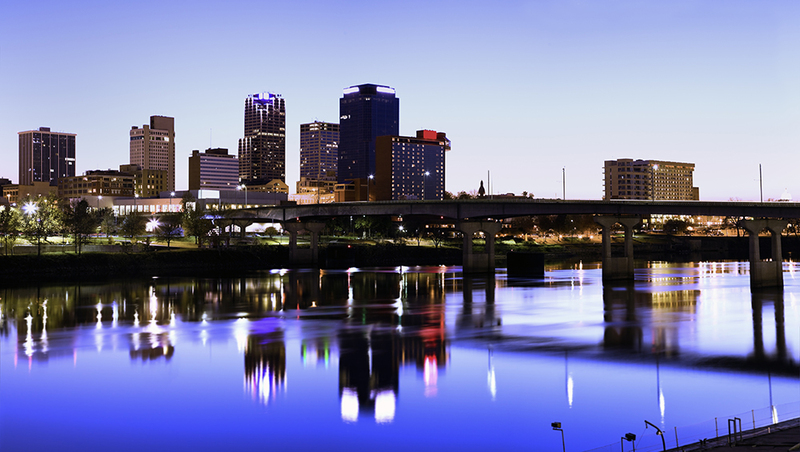 The capital city of Little Rock is one city that is experiencing gold rush-like expansion. Road construction, new commercial and residential construction, and jobs are blossoming in an economic climate that the rest of the country would envy. The city of Little Rock is the largest city in the state of Alabama, and it is also the state's capital city and the county seat of Pulaski County. It had a growing population of 198,541 as of 2016, and it is part of the larger Little Rock-North Little Rock-Conway AR Metropolitan Statistical Area with a population of 734,622. This population ranks this metro area as the seventy-fifth largest in the United States. 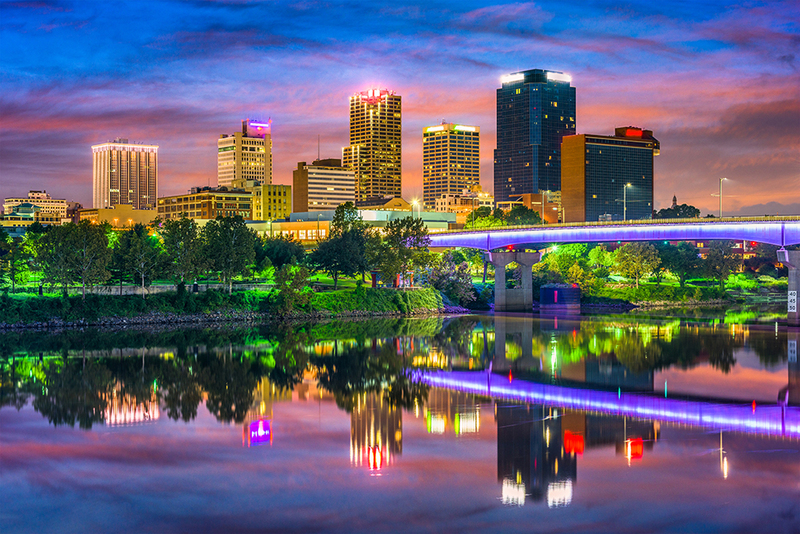 Little Rock functions as a very important cultural, government, transportation, and economic hub for the state of Arkansas and the South as a whole. The economy is very diverse, and several large companies and corporations have their headquarters here. Additionally, some of the largest non-profits in the world also have their headquarters here. There is also a large river port located in this city, and it helps to support the industrial business sector. Healthcare, education, and startups all contribute to the economy as well. Little Rock has a healthy economic center, with corporations such as Dillard’s, Windstream Communications, and Acxiom headquartered there. Industries such as biotechnology, healthcare, information technology, and aerospace are all emerging to contribute to Arkansas’ overall economic welfare. You'll experience a humid subtropical climate zone in the city of Little Rock, and this means you'll have very hot, humid summers and mild, short winters with little to no snow. June through August are the hottest months with temperatures ranging in the mid-90s with little rain. Little Rock sees drought-like conditions in the summer months, and these usually continue until November. The winter months start in November and run through the end of February with temperatures hovering around the mid-50s. The temperatures in the winter months can fluctuate greatly depending on the warm air currents. There are many tourist attractions, cultural events, performing arts groups, theaters, and museums located around the city. The Arkansas Arts Center is the largest in the state, and it has eight art galleries featuring works by Van Gogh, Rembrandt, and more. The Arkansas Repertory Theatre is the state's largest not-for-profit theater company that shows dramas, comedies, and musicals. You can also visit the headquarters of the global hunger and poverty relief organization, Heifer International. Finally, Wildwood Park for the Arts is the largest in the South, and it features many festivals and performances each year. There are two universities, several technical colleges, public and private schools, and specialty schools located in Little Rock. The Arkansas School for the Blind and the Arkansas School for the Deaf are here, as well as the large Little Rock School District with over 25,000 students. Students can also attend the University of Arkansas for Medical Sciences or the University of Arkansas at Little Rock. If you want to attend a tech college, Pulaski Technical College is also here, or you can attend the Clinton School of Public Service and get your Master's Degree in Public Service. The largest employer in Little Rock is the University of Arkansas for Medical Sciences with over 9,500 employees. Additionally, this system contributes over $5 billion per year to the Arkansas economy. The second-largest employer in the city is Baptist Health with over 6,900 employees. Finally, the third-largest employer in the city is government-based and the Little Rock Air Force Base has over 4,500 employees. The economy in this city is very strong, and the unemployment rate is well below the national average. Also, there has been recent job growth of over 2%, and this drives the unemployment rate down even further than the national average. Over the next ten years, the economy is projected to get even stronger as over 40% more jobs are slated to be added into the current economy. Little Rock offers potential residents thousands of available properties from the center of the city all the way to its outlying suburbs. With properties ranging in price from $100,000 to $600,000, there are many options for homebuyers to choose from. The current local median home price is hovering around $131,900 with a price per square foot of $101. These prices have gone up .9% in the past year, and they're projected to go up another 2.3% in the coming year. The local median home price for the Little Rock Metro area is $179,900 with an average price per square foot of $95. 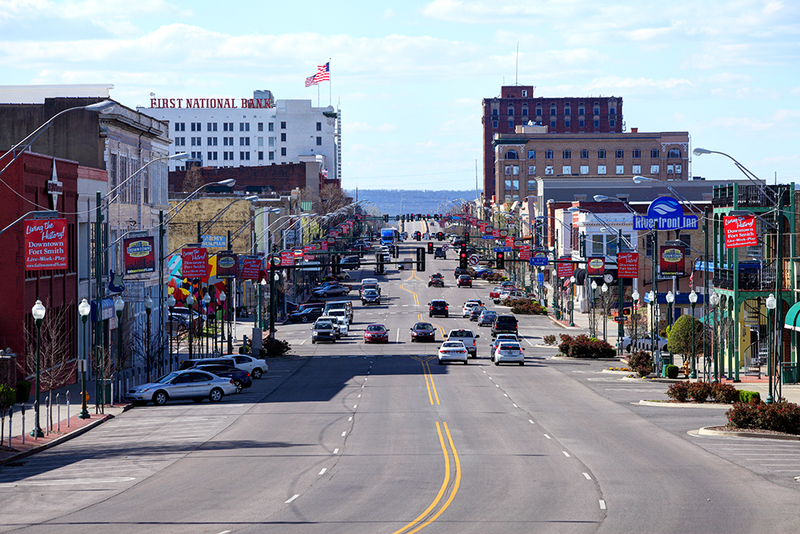 The second-largest city in Arkansas is Fort Smith, and as of 2016, it had a population of 281,227 people. It has a sister-city relationship with the Italian city of Cisterna, and this is because of the World War II battle of Cisterna was fought by US Army Rangers that were led by a Fort Smith native. This city is found on the Arkansas-Oklahoma border, and it was originally a frontier military post in the 1800s. This city has a long history with the industrial manufacturing industry, and this trend continues today. There are several major industrial manufacturing plants throughout this city that supply a large portion of the local economy. Additionally, several large corporations are based here, and the healthcare industry is also a major sector of the economy. Other notable economic sectors are education and the government. The humid subtropic climate zone influences this city, and residents experience long, hot, and humid summers with cool, mild winters. There is rarely any snow, and the city is prone to droughts in late summer and early autumn. June through August are the hottest and the driest months with temperatures sitting in the high-80s and very little rainfall. December through March are the coldest months with temperatures sitting in the mid-50s to the high-40s. Fort Smith is also located very close to the infamous Tornado Alley, and it routinely sees severe weather in the spring and early summer months. Fort Smith has been the filming location of two movies over the decades, and it has several historical points of interest including museums and tourist attractions. There is also a very active music scene with the Fort Smith Symphony being the oldest symphony orchestra in the state. Tourists can visit the Central Mall which is the largest indoor shopping center, or they can visit the various museums including the Fort Smith Museum of History. The Fort Smith School District is a public school district that serves the city and has more than 26 schools enrolled. Students can attend the University of Arkansas at Fort Smith, or they can attend the new private, non-profit institution that opened in 2017, the Arkansas College of Osteopathic Medicine. There are also two satellite campuses located around the city and they are the John Brown University and Webster University. The economy of this city is very diverse, and this diversity reflects from the top three employers. The largest employer in the city is Sparks Health System with over 2,400 employees. The second-largest employer is the Baldor Electric Company, and they have over 2,300 employees. Finally, the third-largest employer in Fort Smith is the OK Foods company with 1,800 employees. Fort Smith has a very strong economy that currently has an unemployment rate that is well below the national average. In addition to this, it also has had over a 2% growth in the job market recently. The economy is looking to strengthen even more with the outlook predicting that there will be a 40% increase in the number of available jobs over the next ten years. Fort Smith is undergoing a transformation that has those born in the area that left and returned scratching their heads and checking their GPS systems to see if they are in the right area; they are finding it almost unrecognizable. Low taxes, more millionaires per capita, and the beautiful Ozarks beckon new residents. The local median home price for Fort Smith is currently around $110,400, and this is a growth of 6.9% in the past year. The price per square foot is around $83, and both of these figures are projected to rise another 2.4% in the coming year. The Fort Smith Metro area has a local median home price of $149,000 and a price per square foot of $81. 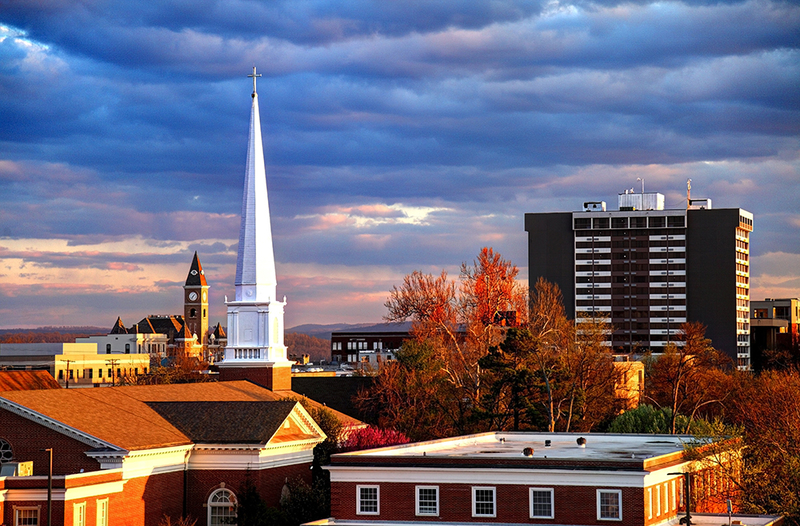 The third-largest city in Arkansas is Fayetteville with a population of 83,826 people. This city is the seat of Washington County. Located in the north central area of the state, the city is part of the Fayetteville-Springdale-Rogers Metro area, with a combined population of these areas is 525,032 as of 2016. This population makes this Metro the one hundred fifth largest Metro in the Nation. You'll find this city on the outskirts of the Boston Mountains, and it is located deep in the Ozarks. The elevation of this city is 1,400 feet, and this makes it one of highest major cities in the United States. The local economy is largely based in the education sector, and this sector as a whole has influences all over Fayetteville. The healthcare sector also makes up a large portion of the local economy, and the industrial sector rounds out the top three major economic influences you'll find here. Major industries that contribute to Fayetteville’s economic climate include aerospace and national defense, computer services, agriculture, and consumer products. Corporations such as Apria, Bausch & Lomb, Hormel, Cargill, and Cisco all call Fayetteville home. Greater Fayetteville and its outlying areas offer over 1,500 real estate opportunities. The city ranked 8th on Forbes Magazine's “Top 10 Best Places in America for Business and Careers” and 7th on Kiplinger's 2008 "Best Cities to Work, Live and Play”. Fayetteville has a humid subtropical climate that is classified by extremely hot and humid summer months with short and dry winters. It does experience four distinct seasons every year, but the higher elevations shield Fayetteville from some of, the colder air masses. From June through September the temperature typically stays in the mid-80s, and this drops slightly in October. November through February are the coldest months with temperatures ranging in the mid-40s to the lower 50s. There is moderate rainfall year round, but spring is the wettest time of the year. The city has a unique mix of a college town, Southern city, and a larger city feel. There is a large arts and music scene with many museums, venues, and events going on year-round. You can visit the Bikes Blues and BBQ motorcycle rally, or take in one of the numerous music festivals like the International Folk Festival. The Airborne and Special Operations Museum is a point of interest, or if you have kids you can visit the Fascinate-U Museum. Notable places in Fayetteville include The Botanical Garden of the Ozarks, the University of Arkansas, and the Northwest Arkansas Mall. The Fayetteville Public School System serves this city, and it ranks as one of the 350 best high school systems based on AP placement test scores. The University of Arkansas was founded here and it remains a huge economic support to this day. Being home to the University of Arkansas track and field program, and its popularity gave Fayetteville the nickname of “Track Capital of the World”. Finally, students can choose to go to the Haas Hall Academy as well. The largest employer and overall influence on Fayetteville as a whole is the University of Arkansas with over 1,300 staff. The second-largest employer is the Washington Regional Medical Center with around 1,000 employees. Finally, the third-largest employer in the city is Veterans Administration Medical, and this facility has over 800 staff members. The local economy is stable, and it has a positive outlook. Currently, it has an unemployment rate that ranks well below the national average, and it saw recent job growth of over 6%. Over the next ten years, the local economy is on track to add up to 48% more jobs in a variety of fields. From single-family homes to apartments, condominiums, or even land to develop, Fayetteville welcomes newbies! The local median home price for Fayetteville is $190,500 with a price per square foot of $120. These figures have risen over 5.5% in the past year, and they're projected to rise another 2.7% in the coming year. The Fayetteville-Springdale-Rogers Metro has a local median home price of $274,750 with a price per square foot of $112. The fourth-largest city in Arkansas is Springdale with a 2016 population of 78,557 people. This city is part of the Fayetteville-Springdale-Rogers Metro area, and they have a combined population of 525,032 people. You'll find this city in Northwest Arkansas, and it is located deep in the Ozarks on the Springfield Plateau. For decades the local economy survived on the agriculture and farming industry. However, in recent decades, this focus has begun to shift, and it has experienced a rapid diversification and growth of the economy. Currently, there are three large Fortune 500 companies headquartered here, and it has a thriving poultry processing industry. The humid subtropical climate zone influences this city, and residents typically experience hot, humid summer months and cool, mild winter months. July through August are traditionally the hottest months with temperatures topping out in the high 80s. The winter months run from December through March, and temperatures bottom out around the mid-20s to low-30s. Spring and fall are usually the wettest parts of the year with the summer months being drier and more humid. Sports are a huge draw for this city, as well as the art and music scenes. Tourists can visit the Arvest Ballpark, which features 6,500 seats with room for more on the green. You can also visit the Shiloh Museum of Ozark History or the Fitzgerald Station and Farmstead. The Springdale Public School District serves this city, and it is the second-largest public school district in the state. There are several small public and private schools to choose from, and there are a few smaller secondary education opportunities as well. Students can attend Ecclesia College or they can choose the Northwest Technical Institute for occupational training. The largest employer in the city is also one of the three Fortune 500 companies based here. Tyson Foods currently employs around 4,300 employees. The second-largest employer in the city is Springdale Public School District with over 2,300 people. Finally, the third-largest employer is Cargill Meat Solutions with 1,200 employees. The local economy is thriving in Springdale, and it has an unemployment percentage that is well below the national average. In addition, the economy also saw an increase in jobs in the past year by over 6%. In the next ten years, the economy is projected to improve by another 48%. The local median home price in Springdale is $149,600 with a price per square foot of $110. These numbers have increased by 6.2% in the past year, and they're currently on track to increase another 2.8% in the coming year. The Fayetteville-Springdale-Rogers Metro has a local median home price of $274,750 with a price per square foot of $112. The fifth-largest city in the state of Arkansas is Jonesboro with a population of 74,889 people. It is part of the larger Jonesboro Metro area, and the combined population is 129,858 people. This is the largest city in northeastern Arkansas, and it is classified as a large college town. The local economy has influences from the education, agricultural, medicine, trade, and manufacturing sectors. It is considered to be a regional hub for all of these different industries. The economy gets a significant boost each fall with new college students coming to stay and attend classes. Jonesboro is also classified by a humid subtropical climate, and it has long, hot summers and mild winters. July and August are traditionally the hottest months with the temperatures staying in the low 90s for most of the month. January through March are the coldest months with temperatures staying in the low 30s. While there is rainfall year-round, the spring and early summer months tend to be the wettest months of the year. The city has a dedicated sports fan base, and there are a few areas of interest for tourists to visit. The Mall at Turtle Creek is the largest indoor shopping facility in northeastern Arkansas, and it has been in operation since 2006. The Arkansas State Red Wolves are based here, and they play several games a year in the city. The Jonesboro Public School District serves this city, and it has over 4,000 enrolled students. Additionally, Jonesboro is home to Arkansas State University, and students can also attend the New York Institute of Technology College of Osteopathic Medicine. The largest employer in Jonesboro is Arkansas State University and it currently has over 2,000 members on its staff. The second-largest employer is the Quackertime company headquarters with over 1,200 employees. Finally, the third-largest employer is St. Bernard's Healthcare with around 1,000 staff. While this city does have a slightly higher unemployment rate, it is still well below the national average. In the past year, the area has had almost a 5% increase in the availability of jobs. Future projections are also favorable, with over 40% more jobs slated to be added in the next ten years. The local median home price for Jonesboro is $132,700 with an average price per square foot of $101. This is an increase of 2.6% over the past year, with a projected increase of 0.3% in the coming year. The Jonesboro Metro has a local median home price of $175,000 and a price per square foot of $99. According to the United States census an estimated 2,988,248 people live in the state of Arkansas. The state has 52,035.48 mi² of land area, which gave it a population density of 57.43 per mi². Here is a list of cities with more than 2,000 residents, with their estimated population as of June 2016 & the 2010 United States Census. For Census Designated Places (CDP) where there was no population estimate available for 2016 the 2011-2015 American Community Survey 5-Year Estimates data was used. As of 2019 the conforming loan limit across the United States is set to $484,350, with a ceiling of 150% that amount in areas where median home values are higher. High local affordability makes the $484,350 ceiling apply statewide for single unit homes. Dual unit homes have a limit of $620,200, triple unit homes have a limit of $749,650 & quadruple unit homes have a limit of $931,600. People buying premium properties in the Little Rock metro area may be above these thresholds, requiring a jumbo loan. Jumbo loans typically have a slightly higher rate of interest than conforming mortgages, though spreads vary based on credit market conditions. In Arkansas, there are a few programs that were developed to help low or moderately low-income applicants qualify and afford a mortgage. The Arkansas Dream Downpayment Initiative (ADDI) program provides down payment assistance for low-income households. The funding comes in the form of a second mortgage that will be forgiven after five years. This funding can provide the home buyer up to 6% of the purchase price on their home, and it caps at $10,000. The “ADFA Move-Up” Single Family Loan Program is designed to help moderately low-income applicants obtain a home loan. Unlike many loan programs, there are no income limits to worry about, and it works with FHA, VA, Conventional, and Rural Development home loans. Applicants who qualify for this program will get a mortgage with an interest rate between 4.00% and 4.625%. This home loan comes as a 30-year fixed-interest loan. Additionally, there are no prepayment penalties, so applicants are able to pay their mortgages off sooner without a penalty. This loan can be used to purchase a home up to the Arkansas conventional conforming loan limit of $424,100. Most of Arkansas has a very low earthquake risk. The northeastern corner of the state near where Arkansas, Illinois, Indiana, Kentucky, Tennessee, and Missouri converge there is a fault line which leads to moderate to high earthquake risk. Here is a list of counties with a risk above very low. Homeowner's insurance policies typically do not cover flooding. Most of the state has a very low risk of flooding. Some areas close to the Missississippi river have a high to very high flooding risk. Here is a county-by-county breakdown of areas with an elevated risk of flooding. Most of the state is considered to have a moderate to high tornado risk. A basic homeowners policy should cover financial damages from tornadoes. Hail damage is common across the state. Damage from hail is typically covered by home insurance policies. Arkansas is home to the eleventh-lowest property tax rate in the nation. On average, the median homeowner property tax payment is $1,006 per year. This works out to be roughly 0.67% of the property's assessed market value. Additionally, this rate is around 1.1% of the property owner's assessed yearly income, and this is the third-lowest in the nation. Property taxes do vary from county to county, and Benton County currently collects the highest property taxes each year. The average Little Rock homeowner pays $1,349 a year in property taxes. The lowest property tax collecting county is Calhoun County with $275.00 per year. Mortgage services are required to provide defaulted homeowners with specific documents relating to the foreclosure including copies of the note and any payments, the physical location of said documents, and a current payment history. Mortgage lenders are also required to provide the defaulted homeowner with information about loss mitigation or loan modification programs that might be available to them before to foreclosure. This information has to contain contact information for any programs offered by the mortgage lender as well as any contact information for government-sponsored mitigation programs that the homeowner may be eligible for. They can allow the home to be foreclosed on. They can sell the home in a short sale. They can transfer the title to the property directly to the mortgage lender with the deed in lieu of foreclosure. Foreclosures in Arkansas are handled inside as well as outside of the court system. Either way, the lender must appraise the property before the scheduled foreclosure date. In foreclosures handled through the court system, the court gets to decide the amount in default and then gives the borrower a brief amount of time to remit that amount to the lender. If the borrower is unable to pay the amount in full within that period, the property then is put up for sale; this is usually 30 days after the court first hears the matter. Arkansas is a state where the most common foreclosure method is a nonjudicial foreclosure, and this means that mortgage lender usually forecloses on the property without involving the court system. However, the state also practices judicial foreclosures as well. In foreclosures handled outside of the court system, mortgages that contain “Power of Sale” clauses let lenders foreclose on property in default by filing a “Notice of Default” with the county. The borrower then has the opportunity to stop the foreclosure process and keep the property by paying the delinquent amount in full any time before the foreclosure sale occurs. Arkansas is also a recourse state with restrictions. A recourse state means that a mortgage lender can sue a defaulted homeowner if they lose money in the sale of the foreclosed property. However, Arkansas has a few restrictions on this process. The mortgage lender has 12 months to sue the defaulted borrower for any deficiencies with limits. If the mortgage lender chose to proceed with a judicial foreclosure, they could sue the defaulted borrower for the full amount of any deficiency they may have had. There is no limits with this type of foreclosure. Arkansas has much to offer, including great real estate opportunities, a growing economy, popular cities, and rapid growth. Carefully considering purchasing property in Arkansas is important, and borrowers need to make sure they understand the different types of loans available and the consequences if those financial responsibilities go unfulfilled. Check out the following resources to learn more about the Arkansas real estate market.